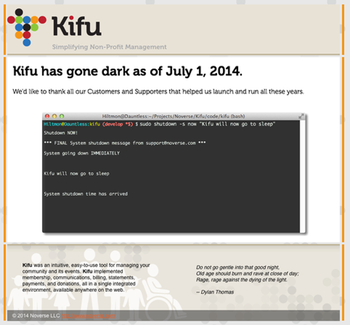 On Monday night, June 30, 2014, I’ll be taking the Kifu servers down and putting up a static sunset site. I built it, they did not come. It’s time to go dark. I know we built it right. We spent years looking at the market for non-profit management systems and found thousands and thousands of potential customers publicly expressing real needs. We met with many, many different kinds of non-profits to talk about that they needed, and with even more to talk about what we could do. We tested the idea, refined it and sought out more to talk with. We did this for three years. Only then did my partners and I decide to go ahead, set up a company and do it. When I committed the first line of code on July 5, 2011 at 11:14PM, we knew we had a great product idea for a massive, hungry market. This was a winning idea. We even decided to bootstrap the product, give up our time, effort and potential income to make this thing. At the time I was independent, running my own company (Noverse), designing and developing systems for Hedge Funds and iOS applications for my own clients. I decided to take the chance that Kifu would work out. 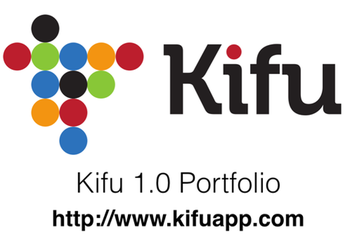 So I stopped taking on new clients, I completed the iOS work I had, and I started to spend all my time developing the minimum viable product that was to be Kifu version 1.0. How often does one get to design and build a leading edge product that you just know people will love, because they have already told you they need your solution. It was designer and programmer nirvana. Coding all day, dealing with some amazing creative people who provided art and words, and occasionally meeting even more potential customers and sharing the idea. On December 9, 2011, I committed v0.7 and we brought on our first customer. They were so excited and could not wait for beta, and were happy to be our alpha testers. Turns out this too was a very good thing. A few of our ideas did not work as well in the real world and with this customer’s help, we tuned and made the product even better. On March 6, 2012, out came v0.9, and we went into beta. Several new customers started to migrate on. 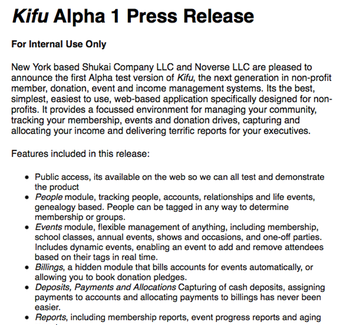 We put up the public web site, and started telling folks that the final product would be available for everyone soon. Almost one year from the start, on July 2, 2012, I pushed out version 1.0. I had spent an entire year of my life putting this product together and talking to folks about it. For the rest of 2012, I continued to add features, go out and meet people and show them the product. Almost all expressed interest, they all saw it was better than what they had, that it met their needs and was cheaper than their current process. But they did not come. This was the hardest time for me personally. I had spent a year without much income building this thing in the belief that it was what all these folks had expressed was what they needed. And then it was no longer in idea, it was a real product. They all loved it when they saw the demos, and it passed all their tests with flying colors. But when the time came for them to sign up, they did not. Their reasoning never had anything to do with their need (we filled it) or price (we were better) or quality of product (we hit their sweet spots). It was “too hard” to migrate (even though we had run several migrations and offered to do it for free) or our company was too small or our track record was too short. Or they did not want to think about it now, or wanted to wait until year end, or “run it up the tree”. They simply did not come. This confused me. I did not understand why these good folks were prepared to spend more money on inferior systems that were rife with faults, workarounds and were easy to defraud. I did not understand why they were prepared to spend more to do things manually, incorrectly and frustrate their constituents. I did not understand why they loved my product, spent vast amounts of time and effort discussing and reviewing it, but would not commit to it. Luckily for me I had Noverse, new clients, new projects and new challenges to get me out of the funk, and put a few dollars in the bank. 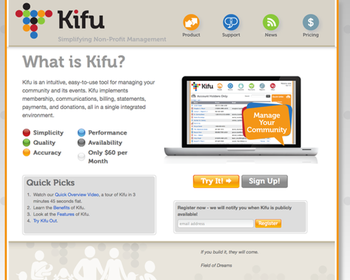 The rest of the Kifu team were out there marketing, and I provided technical support, new features and demos. By May 2013, we realized that this was not going anywhere. But we wanted to give it another try, a new marketing push. The product had been out for many months, it was stable and the existing customers were exceptionally happy with it. They still did not come. 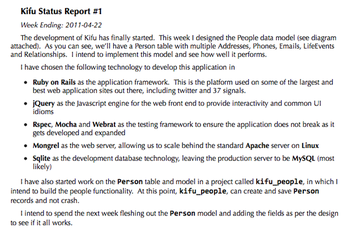 We knew by December 2013 that Kifu was over and started to prepare for the shutdown. It was the right decision to make. There was no point investing more time and effort in a product that had not yet returned any value to us. We had all lost heart and moved on. But we did not walk away. I have spent the last six months making sure that our existing customer’s data is where they need it in the form they need it. And that the servers have stayed up and functional while they migrated away. That has now happened. On Monday night, June 30, 2014, I will back up the servers one last time, point the DNS to the sunset site and shut it down. I am happy and proud that I built it. I can still stand up and state truly that I made a great product. I am sad and disappointed they did not come and the product did not succeed. And there is much I have learned from the experience. 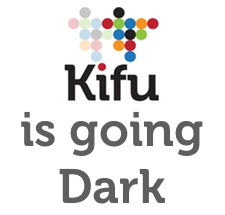 sudo shutdown now "Kifu will now go dark"